Proprietary Name: Phytonadione What is the Proprietary Name? Non-Proprietary Name: Phytonadione What is the Non-Proprietary Name? 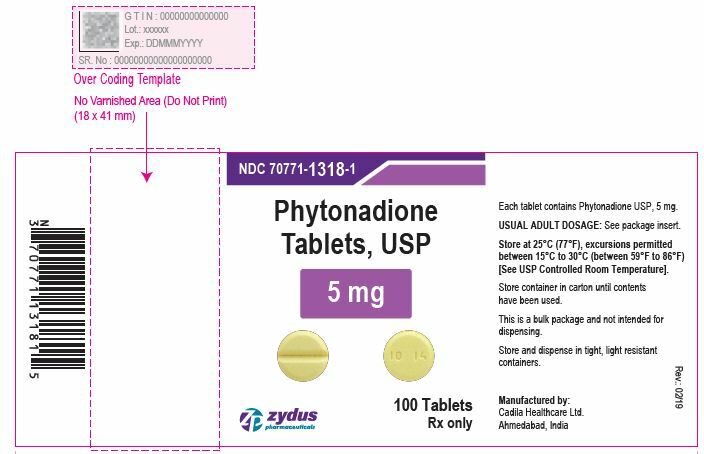 Phytonadione with NDC 70771-1318 is a a human prescription drug product labeled by Cadila Healthcare Limited. The generic name of Phytonadione is phytonadione. The product's dosage form is tablet and is administered via oral form. FDA Application Number: ANDA210189 What is the FDA Application Number? Phytonadione is a vitamin which is a clear, yellow to amber, very viscous odorless or practically odorless liquid. It is soluble in dehydrated alcohol, in benzene, in chloroform, in ether and slightly soluble in alcohol. It has a molecular weight of 450.70.Phytonadione is 2-methyl-3-phytyl-1, 4-naphthoquinone. Its molecular formula is C31H46O2 and its structural formula is:Each uncoated phytonadione tablet, USP for oral administration contains 5 mg of phytonadione, USP and contains following inactive ingredients: croscarmellose sodium, colloidal silicon dioxide, hydroxypropyl cellulose, lactose monohydrate, magnesium stearate and microcrystalline cellulose. Phytonadione tablets, USP possess the same type and degree of activity as does naturally-occurring vitamin K, which is necessary for the production via the liver of active prothrombin (factor II), proconvertin (factor VII), plasma thromboplastin component (factor IX), and Stuart factor (factor X). The prothrombin test is sensitive to the levels of three of these four factors – II, VII, and X. Vitamin K is an essential cofactor for a microsomal enzyme that catalyzes the post-translational carboxylation of multiple, specific, peptide-bound glutamic acid residues in inactive hepatic precursors of factors II, VII, IX, and X. The resulting gamma-carboxyglutamic acid residues convert the precursors into active coagulation factors that are subsequently secreted by liver cells into the blood.Oral phytonadione is adequately absorbed from the gastrointestinal tract only if bile salts are present. After absorption, phytonadione is initially concentrated in the liver, but the concentration declines rapidly. Very little vitamin K accumulates in tissues. Little is known about the metabolic fate of vitamin K. Almost no free unmetabolized vitamin K appears in bile or urine.In normal animals and humans, phytonadione is virtually devoid of pharmacodynamic activity. However, in animals and humans deficient in vitamin K, the pharmacological action of vitamin K is related to its normal physiological function; that is, to promote the hepatic bio synthesis of vitamin K-dependent clotting factors.Phytonadione tablets, USP generally exert their effect within 6 to 10 hours. Phytonadione tablets, USP are indicated in the following coagulation disorders which are due to faulty formation of factors II, VII, IX and X when caused by vitamin K deficiency or interference with vitamin K activity.Phytonadione tablets, USP are indicated in:anticoagulant-induced prothrombin deficiency caused by coumarin or indanedione derivatives;hypoprothrombinemia secondary to antibacterial therapy;hypoprothrombinemia secondary to administration of salicylates;hypoprothrombinemia secondary to obstructive jaundice or biliary fistulas but only if bile salts are administered concurrently, since otherwise the oral vitamin K will not be absorbed. An immediate coagulant effect should not be expected after administration of phytonadione. Phytonadione will not counteract the anticoagulant action of heparin.When vitamin K1 is used to correct excessive anticoagulant-induced hypoprothrombinemia, anticoagulant therapy still being indicated, the patient is again faced with the clotting hazards existing prior to starting the anticoagulant therapy.Phytonadione is not a clotting agent, but overzealous therapy with vitamin K1 may restore conditions which originally permitted thromboembolic phenomena. Dosage should be kept as low as possible, and pro thrombin time should be checked regularly as clinical conditions indicate.Repeated large doses of vitamin K are not warranted in liver disease if the response to initial use of the vitamin is unsatisfactory. Failure to respond to vitamin K may indicate a congenital coagulation defect or that the condition being treated is unresponsive to vitamin K.
Studies of carcinogenicity or impairment of fertility have not been performed with phytonadione tablets, USP.Phytonadione tablets, USP at concentrations up to 2000 mcg/plate with or without metabolic activation, was negative in the Ames microbial mutagen test. Pregnancy Category CAnimal reproduction studies have not been conducted with phytonadione tablets, USP. It is also not known whether phytonadione tablets, USP can cause fetal harm when administered to a pregnant woman or can affect reproduction capacity. Phytonadione tablets, USP should be given to a pregnant woman only if clearly needed. Safety and effectiveness in pediatric patients have not been established with phytonadione tablets, USP. Hemolysis, jaundice, and hyperbilirubinemia in newborns, particularly in premature infants, have been reported with vitamin K.
It is not known whether this drug is excreted in human milk. Because many drugs are excreted in human milk, caution should be exercised when phytonadione tablets, USPis administered to a nursing woman. Clinical studies of phytonadione tablets, USP did not include sufficient numbers of subjects aged 65 and over to determine whether they respond differently from younger subjects. Other reported clinical experience has not identified differences in responses between the elderly and younger patients. In general, dose selection for an elderly patient should be cautious, usually starting at the low end of the dosing range, reflecting the greater frequency of decreased hepatic, renal or cardiac function, and of concomitant disease or other drug therapy. Severe hypersensitivity reactions, including anaphylactoid reactions and deaths have been reported following parenteral administration. The majority of these reported events occurred following intravenous administration.Transient "flushing sensations" and "peculiar" sensations of taste have been observed with parenteral phytonadione, as well as rare instances of dizziness, rapid and weak pulse, profuse sweating, brief hypotension, dyspnea, and cyanosis.Hyperbilirubinemia has been observed in the newborn following administration of parenteral phytonadione. This has occurred rarely and primarily with doses above those recommended. The intravenous and oral LD50s in the mouse are approximately 1.17 g/kg and greater than 24.18 g/kg, respectively. To correct excessively prolonged prothrombin times caused by oral anticoagulant therapy – 2.5 to 10 mg or up to 25 mg initially is recommended. In rare instances 50 mg may be required, Frequency and amount of subsequent doses should be determined by pro thrombin time response or clinical condition. (See WARNINGS.) If, in 12 to 48 hours after oral administration, the prothrombin time has not been shortened satisfactorily, the dose should be repeated. If possible, discontinuation or reduction of the dosage of drugs interfering with coagulation mechanisms (such as salicylates, antibiotics) is suggested as an alternative to administering concurrent phytonadione tablets, USP. The severity of the coagulation disorder should determine whether the immediate administration of phytonadione tablets, USP is required in addition to discontinuation or reduction of interfering drugs.A dosage of 2.5 to 25 mg or more (rarely up to 50 mg) is recommended, the amount and route of administration depending upon the severity of the condition and response obtained.The oral route should be avoided when the clinical disorder would prevent pro per absorption. Bile salts must be given with the tablets when the endogenous supply of bile to the gastrointestinal tract is deficient. Store in tightly closed original container at 25°C (77°F); excursions permitted to 15 to 30°C (59 to 86°F) [see USP Controlled Room Temperature]. Always protect phytonadione tablets, USP from light. Store in tightly closed original container and carton until contents have been used (See PRECAUTIONS, General).Call your doctor for medical advice about side effects. You may report side effects to FDA at 1-800-FDA-1088.Please address medical inquiries to, MedicalAffairs@zydususa.com Tel. : 1-877-993-8779 or FDA at 1-800-FDA-1088 or www.fda.gov/medwatch.